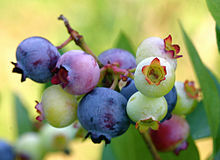 Blueberries are a wonderful fruit that are wonderful on desserts and in muffins. Some even love to have them on their own. They are a fantastic delicacy which are known and eaten all over the world. So can rabbits eat blueberries at all and if they can how much if them can be eaten? Let’s take a look at their nutritional data and find out more about them. In particular their sugar, fat, phosphorous, acidic, protein and calcium content particularly of interest. As you can see blueberries have a hint of phosphorus, calcium, and fat and they have a little acid in them, however they are quite sweet as they contain a lot of sugar. So rabbits can eat blueberries but only in small amounts once a week at the most. One blueberry should suffice. Yes they can eat dried blueberries but they do still contain high amounts of sugar so one dried blueberry will be more than enough for them. Can rabbits eat frozen blueberries? Unfortunately, rabbits can’t eat any frozen foods.